A new study shows that Arctic thermokarst lakes, which form when permafrost melts, trap more greenhouse gases in the long term than they emit. Photo: Katey Walter Anthony, University of Alaska, Fairbanks. New research published this month indicates that some Arctic lakes store more greenhouse gases than they emit, effectively working to cool the climate instead of warming it. The study, led by Katey Walter Anthony (University of Alaska, Fairbanks), was published in the journal Nature and counters a pervasive belief that thawing permafrost uniformly accelerates atmospheric warming. The study focuses on thermokarst lakes, surface depressions filled with melted freshwater that are created when permafrost thaws. The research finds that these lakes are "net climate coolers" when observed over longer, millennial, time scales. Initially the lakes were believed to warm climate because of their strong methane emissions that occur when they’re first formed, according to the study. When viewed over time, however, the lakes switch to become climate coolers because they ultimately soak up more carbon from the atmosphere than they ever release. The researchers observed that roughly 5,000 years ago, thermokarst lakes in ice-rich regions of North Siberia and Alaska began cooling, instead of warming the atmosphere. 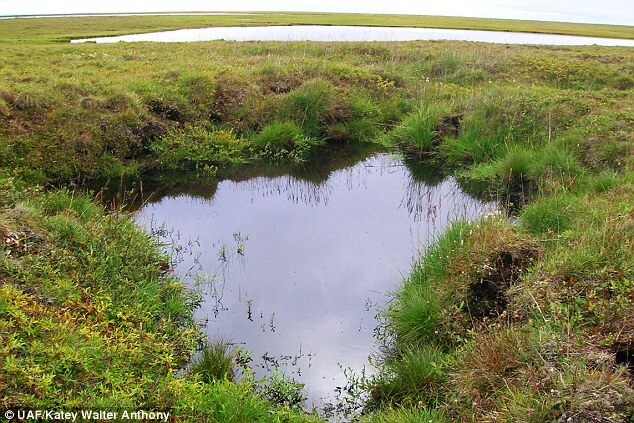 "While methane and carbon dioxide emissions following thaw lead to immediate radiative warming," the authors write, "carbon uptake in peat-rich sediments occurs over millennial time scales." Lead researcher Katey Walter Anthony says in the recent study that until now, thermokarst lakes have believed to be positive contributors to climate warming. Using published data from the circumpolar Arctic, their own new field observations of Siberian permafrost and thermokarsts, radiocarbon dating, atmospheric modeling and spatial analyses, the research team studied how thawing permafrost is affecting climate change and greenhouse gas emissions. Researchers found that "thermokarst basins switched from a net radiative warming to a net cooling climate effect about 5,000 years ago," according to their article. They found that high rates of carbon accumulation in lake sediments were stimulated by several factors, including "thermokarst erosion and deposition of terrestrial organic matter, nutrient release from thawing permafrost that stimulated lake productivity, and by slow decomposition in cold, anoxic lake bottoms." The researchers discovered that mosses and other plants flourish in thermokarst lakes, taking up carbon in rates that are among the highest in the world. The study also revealed another major factor of this process: when the lakes drain, previously thawed organic-rich lake sediments refreeze. The new permafrost formation then stores a large amount of carbon processed in and under thermokarst lakes, as well as the peat that formed after lake drainage. Researchers note that the new carbon storage is not forever, since future warming will likely start re-thawing some of the permafrost and release some of the carbon in it via microbial decomposition. Scientists estimate that 30 percent of global permafrost carbon is concentrated within 7 percent of the permafrost region in Alaska, Canada and Siberia. Consequently, this study's findings also renew scientific interest in how carbon uptake by thermokarst lakes offsets greenhouse gas emissions. Through its data collection, the study expanded the circumpolar peat carbon pool estimate for permafrost regions by more than 50 percent.